Shaolin Kung Fu and Chen Tai Chi as taught in China's Shaolin Temples. Shifu Kwong’s extensive traditional Chinese Martial Arts experience began when he was 6 years old in Burma. Three years later, he moved with his family to China where he continued learning Kung Fu from a retired member of the Special Forces for the next nine years. 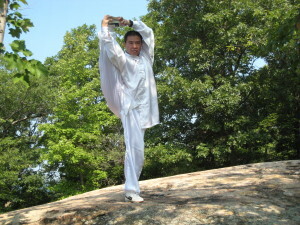 At the age of 19, Sifu Kwong while living in Hong Kong, studied Yang Tai Chi and Southern Praying Mantis. In 1994 Sifu Kwong expanded his practice in New York City when he began learning Shaolin Kung Fu and Qi Gong from Sifu Guolin. One year later, he began training Chen style Tai Chi under Master Ren Guang Yi, one of the foremost practitioners of traditional Tai Chi Chuan. Sifu Kwong has been teaching Qi Gong since 1997, and is dedicated to the practice of the internal Kung Fu arts of Qi Kung and Tai Chi. Shifu Kwong is the Co-Founder and Chief Instructor and The Grandmaster of The Traditional Chinese Martial Arts Cultural Center.